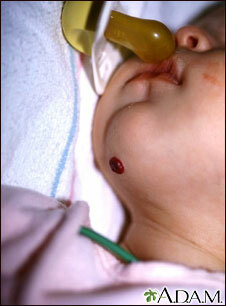 This child has a juvenile hemangioma (strawberry hemangioma) on the chin. These may begin as flat, red spots and later become larger and elevated. Juvenile hemangiomas often go away (involute) spontaneously.